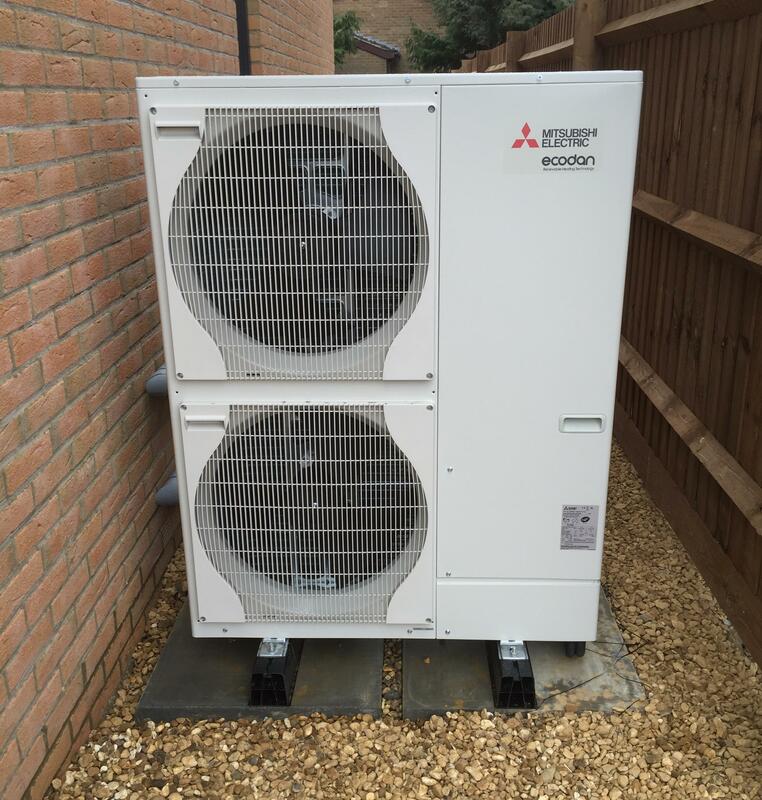 Air Source Heat Pumps, are classed as Permitted Development for the purpose of building and planning regulations – so no planning application is necessary unless the property is in a conservation area or a listed building. ASHP’s can be installed in place of oil/gas or electric boilers and adapted to work with existing radiator/underfloor wet heating systems. Home owners should see a reduction in energy and resulting fuel costs, in many cases they will be eligible for government grants designed to defray some of the capital cost. An outdoor heat exchanger coil, which extracts heat from ambient air. A heat exchanger coil, which transfers the heat into a water tank or indoor heating system, such as radiators or under-floor circuits. An efficient heat pump can provide up to four times as much heat as an electric heater using the same energy. The four times multiple is called the COP (Coefficient of Performance) usually quoted as a seasonal average based on the outdoor temperature. So if a heat pump manufacturer or installer tells you their equipment has a COP of 4.0 then you should ask what temperature range they are referring to. Cash payments are available to homeowners who install renewable heat generation. Payments are made on a quarterly basis over 7 years. When you combine the RHI payments with the energy savings you may well get your money back in a few years. The outdoor unit houses the heat exchanger coil, which transfers the heat into a water tank or indoor heating system, such as radiators or under-floor circuits. An efficient heat pump can provide up to four times as much heat as an electric heater using the same heat energy. The four times multiple is called the COP (Coefficient of Performance) usually quoted as a seasonal average based on the outdoor temperature. Therefore, if a heat pump manufacturer or installer tells you their equipment has a COP of 4.0 then you should ask what temperature range they are referencing. If you have mains gas as a primary heat source, the heat pump savings are not so immediate based on the current relatively lower price of gas. An air-sourced heat pump designed for most domestic applications can extract useful heat down to -25C. If you are lucky enough (or unfortunate) to live in a large period house that is also a listed building, you can still make use of a heat pump however, it makes sense to insulate as well as you can first of all. How can we find out more about the RHI? Both the Energy Saving Trust and Ofgem are official sources of RHI information. Be careful using unofficial sources who may exaggerate the benefits in order to sell you an installation. Will you benefit from installing an ASHP?